Lagos, Nigeria: April 24, 2017: Dipo Faulkner, Country General Manager of IBM Nigeria; Pius Okigbo Jr., CEO, InfoSoft Nigeria and Nkem Begho, CEO of Future Software have been confirmed as part of the speakers for the second edition of Nigerian International Technology Exhibition and Conference (NITEC) which will hold on Tuesday, July 4, 2017. The trio will be joining Gbemi Akande, Co-Founder, DigitalCity Hub; Afolabi Abiodun, CEO, SB Telecoms; Bola Lawal, CEO, ScholarX, Chukwuemeka Fred Agbata, Presenter, Tech Trends on Channels TV among others to discuss the future of big data, analytics and applications for small and medium enterprises (SMEs) development. The conference and exhibition will take place at Sheraton Hotel Lagos from 9.00am to 5.00pm. 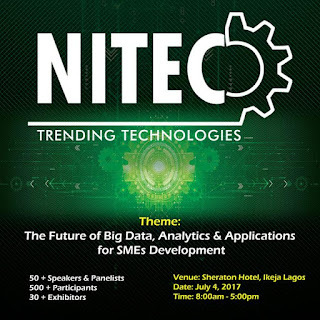 According to the organizers, this year’s event theme: themed: 'The Future of Big Data, Analytics and Applications for SMEs Development', stemmed from the crucial need to help SMEs to improve on their businesses by harnessing tech tools while creating a window for inventors to exhibit their products and ideas. “SMEs are the engine of growth in many economies. Their importance lies in the capacity to generate employment and create wealth, and improved food security, all contributing to significant export earnings and Gross Domestic Product (GDP). Hence, there is a need to increase awareness among the public, policy maker and industrialist on the pivotal role of science and technology plays in national development. As the government map out plans to restore and diversify the nation’s economy, there is no better time to have this conversation than now”, NITEC said in a statement. Participants will also have the opportunity to network and exchange ideas. The theme of the maiden edition was "the Role of Disruptive Technologies in Catapulting the African Continent’s GDP" – showcasing the best of tech innovation and disruptive technologies in Nigeria and Africa at large. The event had in attendance top industry experts from different sectors such as Adedoyin Adeola, Vice President, Network Operations, Airtel Nigeria, who represented the MD/CEO, Segun Ogunsanya; Okoh Ahie, Head of Online Media and Special Publications, Nigerian Communications Commission (NCC); Yele Okeremi, CEO, Precise Financial Systems; Tunde Coker, CEO, Rack Centre; Juliet Ehimuan, Country Manager, Google Nigeria, amongst others. NITEC is a conference that brings together various players in the Nigerian tech ecosystem to discuss issues and develop ways to improve the sector.